I know that basically no one cares about these reviews except me, but I am going to continue writing them anyway. I just wanted to add this note here because I realize that I expounded on the pros and cons of this sunscreen product quite a lot more than I expected! Buzzfeed strikes again! Surprisingly, this particular purchase wasn’t motivated by a need for retail therapy, but by my seemingly neverending search for the perfect sunscreen. I’ve been documenting my sunscreen experiments for nearly four years, but I’ve been trying out different products for about two decades. These days I’ve found a lot of products that I love and am loyal to, but when I see new, potentially superior products I jump at the chance to give them a try. For example, my daily facial moisturizer from Olay is fantastic for many reasons, but it’s only SPF 15. I’ve been looking for one with better sun protection that meets all of my specifications, but I have not been successful yet. I admit that I am incredibly demanding when it comes to sunscreen, and I’m lucky that I have so many options to test, but it’s still frustrating. The SPF 30 version of my favorite Olay face lotion is pretty good, but it’s just too sticky to be used under makeup. Still good for the weekends when I spend more time outside, though. In the last couple of years I’ve tried several higher SPF primers from Bare Minerals and Coola, but they aren’t moisturizing enough for my dry skin (thanks, Los Angeles). 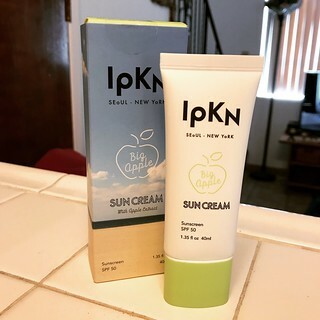 So when I saw IPKN Big Apple Sun Cream (SPF 50) on a list of recommended beauty products I was intrigued. I hadn’t ventured into the world of Korean skin care products before this, but I had heard that they are beneficial for pale women such as myself. And fortunately the Big Apple Sun Cream wasn’t too expensive so I didn’t feel guilty impulsively some from Amazon. You can definitely drop a lot of money on beauty products if you’re so inclined. Without going into a massive amount of detail about all of the times I’ve used this sunscreen over the last week, let’s just say that I still haven’t found the perfect product for me. On the plus side, the Big Apple Sun Cream feels moisturizing without being sticky, practically a miracle, but just doesn’t work as a primer. My makeup settled into the lines on my face very quickly. I even tried two different concealers to make sure that wasn’t the culprit. Unfortunately it was terrible both times. Dang. I will definitely be using this sunscreen on the weekends when makeup is so this sunscreen won’t go to waste. Unlike so many others, I do not regret this purchase!